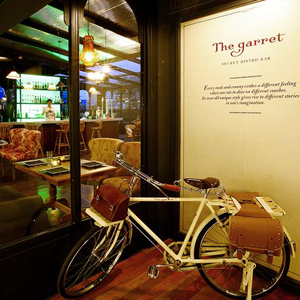 The Garrett has a simple, working formula: good comfort food and plush sofas. You'll get generous portions of Cherry Glazed Ribs, Hamburgers, and Fish & Chips along with fancier combos like Seared Sea Scallops. While décor hints somewhat of 1990's New York—like a fancier version of the Friend's apartment—it's unobtrusive, and good for small groups. A view of Ekamai road and all the Mini Coopers in the building's lower floors completes the package. Take a taxi down Ekkamai, between soi 5 and 6 is the Mini Cooper Showroom. The Garret is on the 6th Floor. Bangkok's Secret Bistro Bar. Also: Win free burgers!